The positive news about this weekend’s cash haul is testament to the potency of the horses-to-watch list (H2W), even with only three winners recorded on a slim menu (many of the lists’ horses are still in queue to race). For the first time in 14 weeks of this season, horses coming in second practically trumped the winners with remarkable across-the-board payoffs, some igniting exactas with the race favorites. Check out the H2W results below and focus on the “Seconds” column. 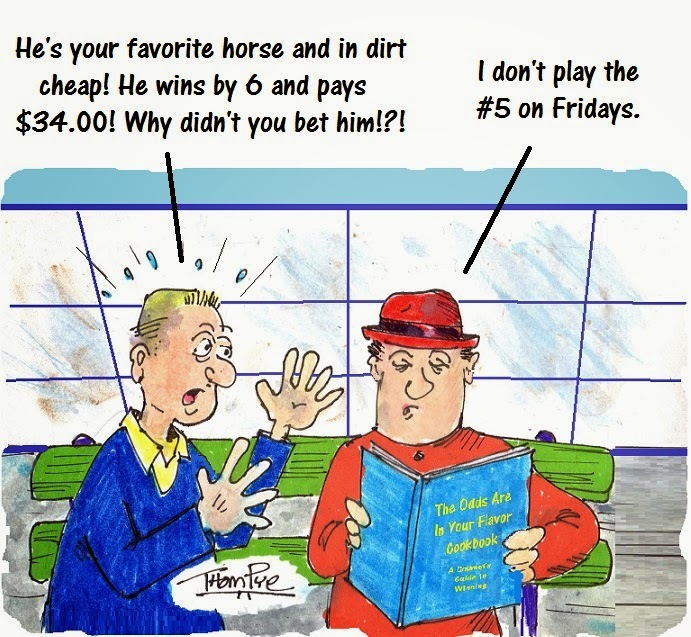 We recorded only one low-priced winner in our sets suggested for the Meadowlands’ Pick 3 and Pick 4 on April 11. Miss Machqueen turned out to be a strong favorite in leg two of the Pick 3, which was the opening leg of the Pick 4. She paid $4.60, $3 and $2.40. In the Matchmaker at Yonkers on Friday, April 11 we were defeated in one leg by a mare we supported in two divisions of the four legs now on the books. Defending Matchmaker champion Feeling You failed for us twice, once at 15-1 and once at 13-1. She did not look to have returned this season with much verve, so we let her go this week and supported Let’s Go Higher. Feeling You awakened in the second Matchmaker division on April 11 and scored at 15-1, while “Higher” was sixth in the short field at 46-1. Our friend, the late Alan Kirschenbaum, bred the seven-year-old that scored her first finish on the board in five tries. Fashion Mystery took the long way around, though with cover, and finished fifth at 26-1 in another leg, while Summertime Lea (6-1) could not repeat from the week before and lost to the first two public choices in division three. The “Levy” at Yonkers on April 12 found us sending out two huge longshots. The first, Keystone Velocity, was 44-1. He finished sixth of seven, making no impression. The division went to the Ron Burke entry at five cents to the dollar. We chose to support Versado this week over Sapphire City, who ignited a decent exacta in last week’s second division and did so again this week. Versado was 43-1 and finished fourth but “Sapphire” took second at 19-1 (The Exacta was $39.80 with even-money winner Mach It So. The field had trouble at the start of the race that caused the triple Burke entry—55 cents to the dollar—to be placed in the last three finishing positions. Versado was bothered in that harangue. Foiled Again continued to dominate the series with another win, while our choice, Dancin Yankee, finished second at 11-1 (no place or show wagering here), sparking a timid exacta of $5.90. TwinSpires switched to Indiana last week with a Hoosier 10-percent Pick-4 Bonus. Every time you cash a winning Pick 4 ticket at Hoosier Park, you receive a bonus equal to 10 percent of the gross winnings, up to $500 per night. We will assist on Twitter occasionally, with suggestions for your tickets. Follow @FrankCotolo and @TwinSpires for choices. The H2W results list across-the-board prices. Also, exactas are included when a H2W horse finishing first or second completes the result with a race favorite or another H2W horse listed in the same race (an asterisk appears when both horses were listed to complete the exacta). More stars have hit the qualifying scene to rev up for the 2014 season. San Pail, Wheeling N Dealin, Charmed Life and Intimidate were among trotters qualifying at Woodbine. Wheeling N Dealin went gate to wire to win by more than 3 lengths in 1:56.2. The disappointing early Hambletonian favorite that did not fire at three as he did at two, is ready to face older. San Pail, the North American horse of the year in 2011, won his second straight qualifier, holding off a determined Charmed Life in 1:55.1. Ontario-owned Hes Watching tops the first 2014 Road to the Meadowlands Pace without having faced or beaten any of the frosh stars. This year's road to the “Pace” is quite different than the 2013 edition. One year ago, just 30 horses were nominated with 29 still eligible after the first payment. A large factor in this was the presence of Captaintreacherous. Fifty-nine three-year-olds were nominated to the Pace and the connections of 56 of them made the March payment. Each week leading up to the event, Director of Racing Operations and odds-maker Darin Zoccali will publish a top 10 of Pace contenders, each of which is assigned a spring-book morning line. Hes Watching begins as the top in Zoccali’s rankings at 4-1. Missing in the rankings is Arthur Blue Chip because recently, the Dr. Ian Moore trained colt suffered a stall injury and will miss a “significant part of the year.” Also noticeable by his absence is National Debt. Undefeated in six starts, National Debt’s absence is due to Zoccali’s assessment. Strange to us is that National Debt has not lost a race yet this year, though he beat no significant sophs. We feel Hes Watching is being over evaluated, since he has only displayed a freaky speed talent, having defeated no impressive contenders while racing solely on the New York Sires Stakes circuit. We will be closely watching Western Vintage, ranked fourth. He was the super favorite in last year’s Breeders Crown frosh pace who choked in the elimination and did not make the final. Luck Be Withyou, ranked third, won the final. For our money, it is astounding the speed performances of Hes Watching won him the frosh-pace division award last year and takes precedence over the class and probable maturity of “Vintage” and “Luckbe” in forecasts. We will be watching the odds closely of those two, respectively, in Pace preps and other early season soph stakes, because with the surge of popularity for Hes Watching, the chances of a major paradigm shift in actual performances may mean profits on the horizon. Dover Downs awards were presented and for the fifth-consecutive meet Corey Callahan was presented the Leading Driver award. Callahan completed the meet with 222 wins, earning $1,995,836 for the horses he drove. It is doubtful he was a flat-bet profit for bettors, though he had his share of overlay winners. Dylan Davis, who had been runner-up the last few season, won the Leading Trainer title. Davis haltered 69 winners during the meet. Nova Artist, for the second time in three seasons, won Horse of the Meet honors. The pacer had 17 starts with seven wins and earned $108,950 in purses.